Okay, I admit, I think I over stayed my holiday time away from here, but I’m back! And this time with more energy than ever to bring you lots of exciting new developments on The Pregnant Chef platform. 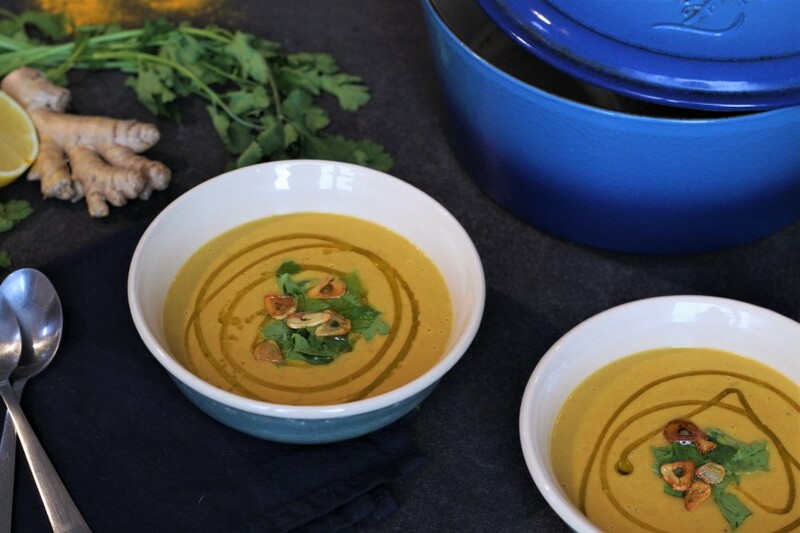 I’m kicking things off by giving you a recipe to the most amazing soup ever. I don’t say that lightly, I can safely say that this is my favourite soup. I make it at least a few times a month as it’s super easy, quick, and really delicious. Pretty much all of my friends and family that have come over for lunch or dinner have had this soup, and it’s always a huge hit! So, naturally, I knew exactly what recipe to share first after this long ‘holiday’. 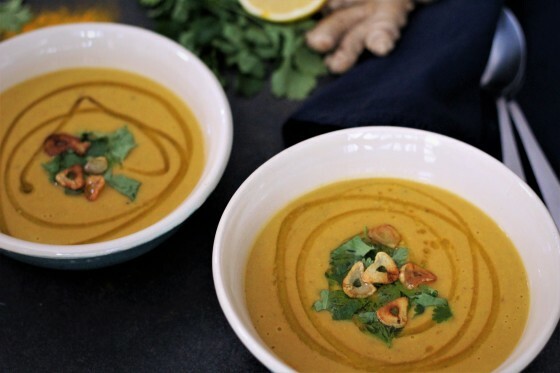 This lentil soup is perfect for the cold season, as it has lots of warming spices like ginger, cinnamon, and turmeric to leave you feeling all warm and fuzzy inside, especially when it’s miserable weather outside. The lentils together with the coconut milk make a wonderfully filling, creamy and satisfying soup. Yet the lemon, coriander and garlic bring in some added freshness and crunch. If you’ve been reading the Pregnant Chef for a while, you’ll know how I’m big a fan of lentils, and I’m always recommending them to all the pregnant mama’s out there, as they are a great source of iron. By adding a bit of lemon juice at the end, the vitamin C will help you absorb the iron in the lentils. Anemia is very common in pregnancy, so I love coming up with recipes with ingredients that are rich in iron, so as to help you avoid or treat anemia during pregnancy. Cinnamon is known to help with blood sugar control, and turmeric is a fantastic anti inflamatory, so it’s always worth thinking about ways to incorporate these spices into your diet! For those ladies out there who have been unfortunate enough to develop gestational diabetes, this soup will be your new friend. Not only does it help keep blood sugar levels stable, but with it’s high amount of fibre, it’ll help keep you regular. But believe me, once you’ve eaten this soup, you won’t need another reason to convince you to make it!